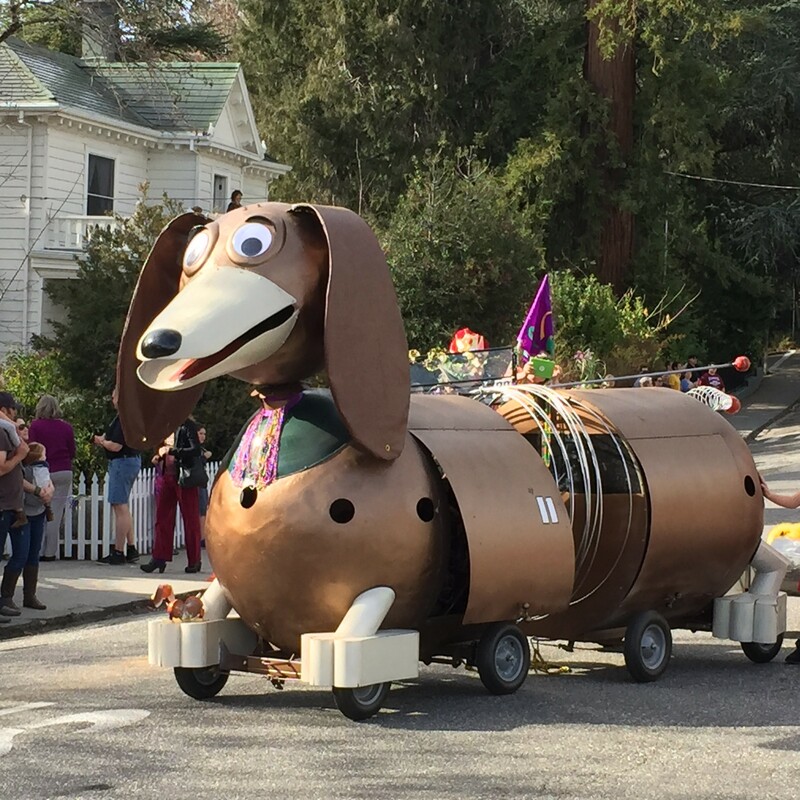 A Doggie Diner-esque float at Nevada City Mardi Gras. February 14, 2016. Plus a profile of Radio Africa's Eskender Aseged, and a creepy-awesome cake maze in L.A.
Porto's Bakery, according to Yelp, is where people just love eating the most. But the Bay Area didn't do so badly, with Berkeley's Cheese Board Pizza ranking no. 2, followed by Gary Danko (no. 6), perennial Yelper favorite Ike's Place (no. 24), Lou's Cafe (no. 53), The French Laundry (no. 57), Wally's Cafe in Emeryville (no. 77), The Codmother Fish and Chips (no. 83), St. Helena's Farmstead at Long Meadow Ranch (no. 85) South S.F. 's Little Lucca Sandwich Shop & Deli (no. 87), Roxie Food Center (no. 95), and DishDash in Sunnyvale (no. 100). If it feels a little random — The Codmother? Mmm-kay — Yelp at least explains the methodology at the bottom of the list. In essence, you can't just be favorably reviewed; you also have to be insanely widely reviewed. Hoodline gave the Bayview pop-up champ the full-length treatment, and if you didn't respect Eskender Aseged already, you will after reading this. Trigger warning: Guy Fieri will be devoting some time on Diners, Drive-Ins and Dives to Radio Africa. 'Member those nuns whose rent got jacked up even though they dedicate their lives to feeding the poor? The crisis seems to have passed now that six-foot, seven-inch motivational speaker Tony Robbins cut two $25,000 checks. Via SFGate, crowdfunding efforts netted at least another $10,000 as well. It's bought them a year, so hopefully the Fraternite Notre Dame Mary of Nazareth's Soup Kitchen at 54 Turk can find a permanent solution. Great news for anyone who's tired of overpriced cioppino: A more-or-less Korean restaurant will open this spring at 505 Beach St. Called Surisan, it's a project with a solid background, as the ownership also manages Kitchen Story, Sweet Maple, and Blackwood American-Thai Fusion, among other places. Hoodline says to look for it in late spring. Is Cultured Meat Ready for Its Close-up? This essay in Salon seems to think the time is right for lab-grown "meat." There is a cake maze inspired by Cirque du Soleil's first adult-only show. Via Gizmodo, it looks spectacularly funhouse-mirror-y. If you go, take pics and email me. And make sure to drive to Burbank for Porto's Bakery.